Will New Jersey hit 70 degrees Thursday? 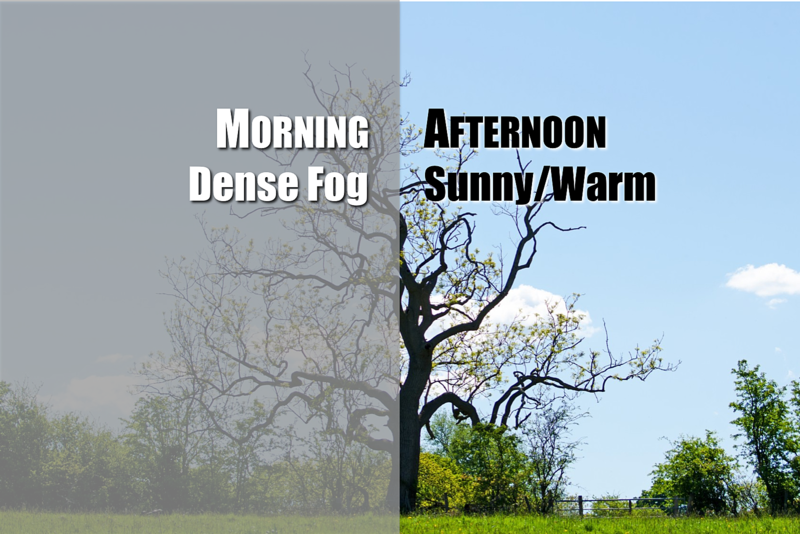 Dense fog and low clouds may prevent record-breaking temperatures, but the Garden State's unseasonable warmth will continue for 3 more days. Ugh, dense fog. One of the most difficult meteorological phenomena to forecast, given the precise marriage of temperature and dew point required for its formation. And one of the most dangerous, as careless drivers love to play it "stupid" instead of playing it safe. Very low visibilities (at or below a quarter-mile) have been reported across New Jersey (especially South Jersey) so far Thursday morning. The National Weather Service has issued a Dense Fog Advisory for 13 counties in central and southern New Jersey. Thursday morning's commute is going to be rough. And I fear this fog will take a while to clear completely. As temperatures begin to climb in the hour after sunrise, conditions should start to improve. But it may not be until mid to late morning that we see perfect visibility statewide. So the big issue for Thursday's forecast — how long will the fog and clouds last? The answer to that question will directly impact how warm temperatures will rise Thursday afternoon. As skies clear to mostly sunny by lunchtime at the latest, I'm holding steady on "mid to upper 60s" for New Jersey's high temperatures on Thursday. North Jersey will probably be a bit cooler, but most of the state should still breach 60 degrees. Could we see a few 70s in South Jersey? Sure — if and only if the fog disappears early enough. That is not guaranteed. A weak cold front will sag through New Jersey Thursday evening. For the most part, the weather impacts will be minimal. However, we will see a chance for isolated showers and even thunderstorms around sunset Thursday. The best forcing, and therefore the best chance for a storm, will be in northwestern New Jersey. The rest of Thursday night will be mostly clear, as temperatures only fall to the lower 50s. Fog will be a good bet once again by Friday morning. I'm now leaning toward seeing more sun than clouds for Friday. So we've warmed the forecast a few degrees. Expect mid 60s in North Jersey, upper 60s for Central Jersey, and some lower 70s for South Jersey. Southeast winds may allow for thicker clouds (and therefore, cooler temperatures) right along the coast. Changes are ahead for the weekend. However, it is important to point out that Saturday will remain warm, with one more day in the 60s. It will also be a mostly cloudy day, with a brisk southeasterly wind (25+ mph). A strong cold front will begin charging through the Garden State late Saturday. A line of gusty showers and thunderstorms is currently forecast to pass from west to east between Saturday late afternoon and early evening. It will be a quick hit of potentially heavy rain, between about 4 p.m. and 10 pm. Saturday. Sunday will be cooldown day. As sunshine resumes, a gusty northwest wind will prevent high temperatures from rising above the mid 40s. Yes, by the end of the weekend, it's going to feel much more like late February. There's a ton of uncertainty regarding the forecast for next week. Having said that, our current call puts Monday in the 40s with a late rain chance, with a warmup through midweek. Source: Will New Jersey Hit 70 Degrees Thursday?